I was waiting all day to get my mail. I was so happy when it came. A letter from my grandmother. It was a full box with the shoes for Zoe in it. I also wanted to give a quick survey update. I haven’t gotten very many surveys on the election lately. The last one I did get I forgot about because it was on the same night as MOMS night out. Therefore, I don’t really care that I missed it. I also tried to cash out at Lightspeed and they changed everything. I’ll do it later when I have more energy. I also looked at Survey Savvy. Nothing. I haven’t made any money with them at all. Oh well. I’ll check up with the rest of them later as well. My Surveys as coupons aren’t going very well right now. Boy this has been an exciting race so far. I am glad that Hilliary didn’t get on the ticket, not because she is a woman but because I didn’t want to see Bill for another four years. I’m not entirely sure who I’m going to vote for yet, but sad to say this will be the first year I vote. I am excited to vote though, We’re either going to either have an African American President or a female vice-president who could very likely become president because Mc Cain is old. His mom sure looks good though. I’ve been getting paid to keep up with the race. Would you like to get paid as well? HCD Surveys Consumer Survey Panel has been paying me to keep up with all of the political mambo jambo. I’m really happy about it too. I wouldn’t have been as involved. I’ve made 14.00 so far. I know you’re not supposed to talk about religion and politics but it is just so exciting. I like both the candidates for different reasons. I’m going to have to listen to the debates. I just hope they stop talking bad about each other. I was also asked to blog about which survey sites i recommended to use as coupons. Well, it’s hard to say so far I’ve only been doing them for a month and you have to reach a minimum with all of them before you cash out. All the others the jury is still out on. I’ll update the list as I know more. I think of survey taking as collecting coupons. 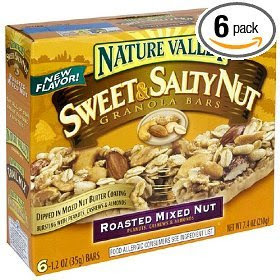 In one case my coupon was a whole box of Sweet and Salty granola bars by Nature Valley. They are very good and addictive. My favorite out of this variety is the Cashew. When I was pregnant with my son I couldn’t get enough of these. Other times. My coupons are only worth a few cents at a time. I use sendearnings and mypoints as my few cents a day collection. All you have to do is click on your e-mail every day and the points will add up. I think to big time survey takers it’s a waste of time, but to me it’s just too easy to pass up. And even further you can collect the larger coupons (surveys) for a few dollars here and there. I’m going to cash out at some survey sites in October in hopes to have a little extra money for Christmass. Having kids is so expensive and I’m trying to offset the cost a little by saving money on groceries. I read on a blog somewhere that if you put the money you saved using coupons in a saving account it’s a good way to get ahead. I’m going to start trying that soon. I just have to talk to my husband about it. Has anyone else tried this. Also, I’m interested in anyones advice on how to save some money.